Distinguished Professor Timothy Mitchell from Columbia University joins Bath as a 2018/19 Global Chair. The University is delighted to welcome Timothy Mitchell, William B. Ransford Professor of Middle Eastern Studies at the Department of Middle Eastern, South Asian and African Studies at Columbia University. Professor Mitchell is a world-renowned political theorist and historian. His areas of research include the place of colonisation in the making of modernity, the material and technical politics of the Middle East, and the role of economics and other forms of expert knowledge in the government of collective life. Professor Mitchell received his BA from Queens’ College, Cambridge University and his PhD in Politics and Near Eastern Studies from Princeton University. Before joining Columbia University in 2008, he taught for 25 years at New York University, where he served as Director of the Kevorkian Center for Near Eastern Studies. The appointment is funded by the International Relations Office’s Global Chair Scheme, a flagship programme designed to attract distinguished, globally renowned scholars to engage in high-profile research activities at Bath. Professor Mitchell is hosted by the Institute for Policy Research (IPR). He will meet with colleagues and students across the University this week and will deliver a research seminar and a public lecture. Professor Jeremy Bradshaw, Pro-Vice-Chancellor (International and Doctoral) will welcome Professor Mitchell today as he arrives in Bath for the first of two Global Chair visits. Professor Mitchell’s world-leading research has extensive cross-departmental interest at Bath, and we welcome his enthusiasm to engage with colleagues in a number of academic fields. Not only will his research be of significant interest to our staff in IPR and in the Faculty of Humanities and Social Sciences but his visit will also be beneficial for our colleagues working on sustainable chemistry, climate change and energy infrastructure. 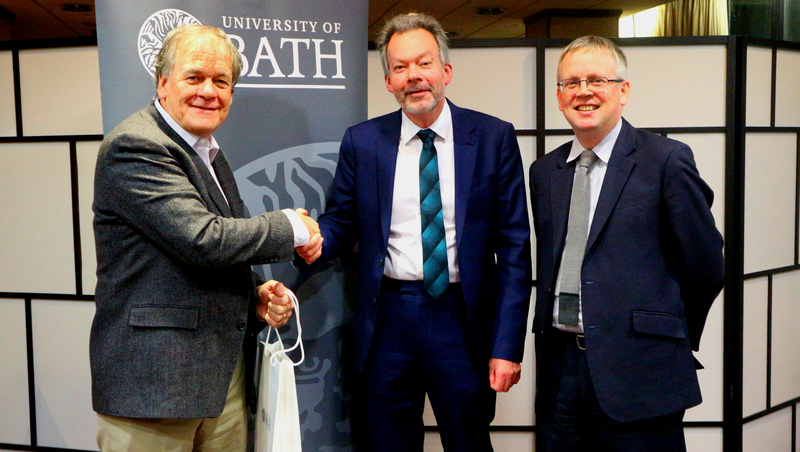 We are honoured to host someone of Professor Mitchell’s calibre and we are sure his visits to Bath will lead to future research collaborations. During his appointment, Professor Mitchell will be working alongside Professor Nick Pearce, Director of the Institute for Policy Research and Professor of Public Policy, and his colleagues in IPR. We are very pleased to welcome Professor Mitchell to IPR as our new Global Chair. His work is critically important to making sense of our current historical juncture. We hope it will be of sustained interest to students and staff from disciplines across the university. Professor Mitchell's first public lecture, entitled No Business of Yours: How the large corporation swallowed the future, will take place on Tuesday, 15 January 2019. All colleagues are welcome to attend.